New Oreo Most Stuf cookies, so named because they feature the "Most. Creme. Ever." that the Oreo brand has ever put in between two chocolate wafers, can now be found on shelves at retailers nationwide. The new, limited-time cookies features more vanilla creme than you find in Double Stuf and Mega Stuf Oreos. Most Stuf Oreos come in 13.4-oz packages for $2.99 (may vary). 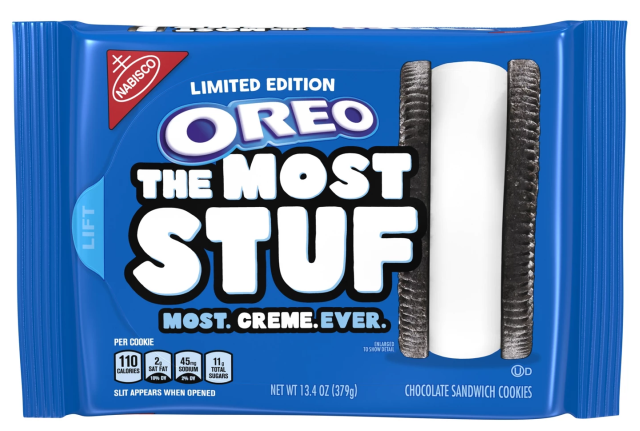 Compared to Mega Stuf Oreos, where one cookie is good for 90 calories, one Most Stuff Oreo comes out to 110 calories. A Double Stuf Oreo is about 70 calories.